One of the simple joys in my life is to achieve a smooth shave with the minimum of fuss. I have now assembled a reasonable number of razors and that number continues to grow at a greater rate than I care to admit. What I’m going to try is that roughly every week I use a razor and present my thoughts on it. I’m continuing my test procedure of two blades for two shaves each and shave every second day so that makes eight days per razor and as there are only seven days in a week, hence the roughly. I want to be honest and if I like a razor, say so and if I don’t like a razor, be up front and let you know why. Let’s see how this goes. I’ve been interested in the single blade razors for a while but lack experience in using them. My theory is that I’ll shave the same way I do with a double edge razor; if it works, it works, if it doesn’t, I’ll have to work out another plan. The OneBlade Core is manufactured from a black polymer and has been weighted with a metal chassis which takes away that cheap plastic feel. The deep black luster of the polymer is very pleasing on the eye. This razor is built to take the Feather FHS-10 blade in a spring loaded pivoting head. Loading the blade is simply achieved by pushing the blade forward in the blade groove from the rear till it clicks home. There is a caution here to stop if you feel any resistance pushing the blade, remove it and try again, the blade is probably not square. After the first few strokes I had to check that I’d fitted a blade. Yes, there was a blade but very little was happening. I was studying the pivoting head and it was not being employed for most of the time so my angle was correct. Added to my woes with the razor was the fact that the wings on the head of the razor, where the blade groove is would not allow me to shave under my nose. Under my nose shaving was later remedied by me changing the angle I was using the razor at. I completed the shave but for me the shave was so mild as to be ineffective; I could still feel stubble after finishing the shave. Unfortunately the next three shaves were little to no better. Growing just on the inside the corner of my mouth is one hair that annoys the living begeezes out of me if it is not removed. Try as I might this razor would not get that hair. Out with a DE razor for just one hair. I fully understand OneBlade’s theory on the pivoting head and while I do not like it, there is an opportunity in the market to capture shavers moving from cartridge razors. The pivoting head makes sense to me on the entry level razor but on a higher level razor???? Nice review @Errol! Keep them coming! This week I chose to use another OneCore product to try. Big brother to the Core, the Genesis is a stainless steel version that has supposedly the same geometry and features; some people will never learn. This razor oozes quality; it is very well machined, has a magnificent finish and is nicely weighted. The handle is basically square with a machined out section that provides great grip at all times. This handle is just another atheistically pleasing and unique feature of the Genesis razor. The head pivots exactly the same as the Core. While doing a pre use inspection of the Genesis I discovered a small flap under the head that pivoted in the end of the handle. If I was to put an ‘O’ ring around this flap I could get rid of the pivoting head feature. First stroke with this razor and I knew I had a nice shaving razor in my hand. It is just on the mid aggressive side of mild but produces a smooth and comfortable shave. This is one razor that I could continue to use daily. I never did have to fit that ‘O’ ring because the razor worked so well. That pivoting head on the Genesis faded into obscurity; I don’t believe I put that feature to the test because everything is set at my angle of attack. That hair inside my mouth never stood a chance against the Genesis. PS. Why 2 ½ Feather blades used. Simple; because the Genesis performed so well I pulled the Core out again. Sadly there is no change to my original thoughts on the Core. Sorry @lerenau. I would love to add photos but try as I mite I cannot get them to the thread. I know @Mark1966 directed someone to a link recently so I tried but it just didn’t work. I’ve given up, even though I know it would improve everything immensely. One of the most asked questions I see around the forum is “How does this razor compare to the Rockwell 6S?” This 6S has been in my possession for around 18 months so its time I put a blade in and find out for myself. Everybody and their dog seems to own a 6S so just a quick description. The Rockwell 6S is a three piece stainless steel razor that comes with three flippable base plates giving six different levels of aggression. With its blasted satin finish, it’s a bit agricultural in both feel and looks but the handle provides really good grip and the razor simply gets the job done; no pretentions, no fuss. I started the shave on plate #4 but after the first single pass changed to plate #5 and left it there for the rest of the test. What a shave? Smooth and confidence inspiring; it’s no wonder that this razor is so popular. Why haven’t I tried this razor before? Pig headiness I guess. Really appreciate your reviews mate! Utilitarian razor, that just delivers. Great for a cruise control shave. Great reviews Errol. We will be happy to read more once you tried other razors. I have now worked out how to post an image. This is the pair of OneBlades. My Karve was in the first batch released December 2017. At the time of purchase the #E and #F plates were not available so I chose the #B, #C and #D plate options so I’m pretty confident I’d have my preferred mid aggression covered. The Karve is a three piece razor manufactured in brass with a most interesting and spectacular knurling pattern on the handle that provides exceptional grip. It is now available with seven plate choices of varying levels of aggression from #AA to #F. The machining on the Karve is first class and the fit of all parts is perfect. One thing I note on every razor is the fit and feel of the way the handle thread screws into the cap screw. The Karve is near perfect, so smooth with little play. The handle length I opted for was the 3 ½” and it has proved to be a good choice. I worked out my start plate would be #C but when I got the razor out it had the #D plate fitted so being basically a lazy bugger at heart I started on #D plate. Big job, you know, to change plates!!!! This proved a great choice with a similar feel to the Rockwell 6S, plate#5, I had previously used. From the first stroke I felt like I knew this razor; it felt just like the brass Charcoal Goods on level #2 and I really like that razor. The razor is smooth and confidence inspiring. I left the #D plate in for my normal test but at the end decided I’d like to try the #C and #B plates. In summary the #B plate was smooth. I did not get the quality of shave I got from the #D plate but it was good. I would not want to go any lower on the mild side than the #B plate though. The #C plate was, as expected, right in the middle of both the #B & #D plates. It was very smooth and I could use it confidently. Overall though I’m choosing the #D plate for my preferred Karve shave. Just prior to starting my Karve test another Karve became available at a price I could not resist so I low and behold I now have another with #A and #B plates. The only difference I can see between the early Karve and the latter is with the packaging. The original packaging did not have any identification on it, the latter does. Waiting now for three more plates from Karve so I’ll have cover from plates #A to #E.
I agree the Karve is a top shelf razor. Could you please compare the plates to Wolfman offerings (Guerrilla, SB standard gap and if you have BBS-1)? I have a rough map planned out and the Wolfman including the BBS-1 are starting in about five weeks. Subject to change. Now I want a Karve razor! But I'll endure until it is stainless steel or titanium. Love the reviews and can't wait for Paradigm vs BBS-1 as heard they are similar shavers. 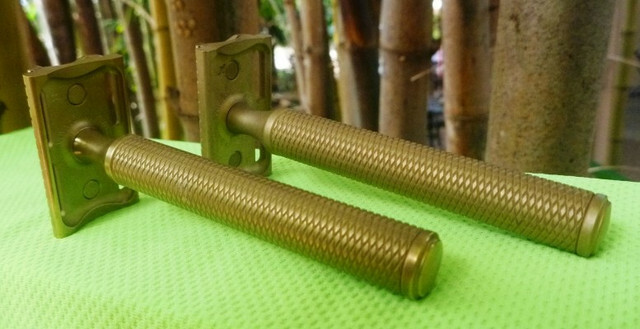 When I think of a Charcoal Goods razor I immediately think of a brass razor. Late in 2017, I checked the Charcoal Goods web site and there were enough pieces listed to buy and assemble a complete razor with #2 plate in the closed comb. I bit the bullet and purchased one with the 3 ½”Bishop handle and antique finish. The Bishop handle was not my preferred handle when I made the purchase (it was the only one available) but in use it is fantastic, able to provide exceptional grip and great balance. Later I was able to buy a #3 plate when Charcoal Goods went to wait list system and later again I purchased a #1 plate. I loaded a Lord Cool blade in the Charcoal Goods using the #2 plate; what a great shave, a great feel, so smooth and confidence inspiring. Next shave I tried the #3 plate but it was too aggressive for me so I went back to the #2 plate and will leave the #3 plate for those more macho than me. I did complete the third shave with the #1 plate fitted. The #1 plate was mild but very usable. I feel I never got as close a shave with the #1 plate as compared to the #2 plate and could feel the stubble a lot earlier. The Charcoal Goods brass razor fitted with the #2 plate provided me with one of my best shaves ever; it was hard to draw myself away from it. How does it compares with other razors? Maybe order them as you go along?